Our one day Bago trip start early in the morning, at around 8.30 am. The private taxi meets us at the hotel lobby sharp at the promised timing. 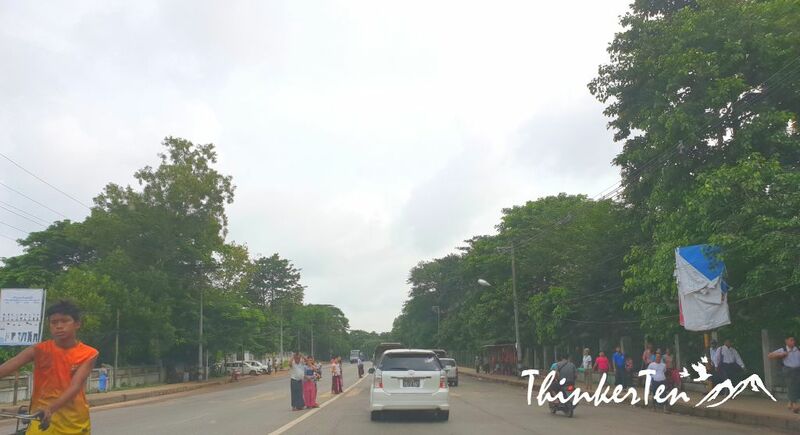 The car approach Inya Lake (picture above) which is one of the largest lake in Yangon after 20 mins driving. Inya Lake is a popular recreational area for the local. It is located next to Yangon University. Inya Lake (beside Kandawgyi Lake) is also an artificial lake built by the British as a water reservoir to provide water supply to Yangon. 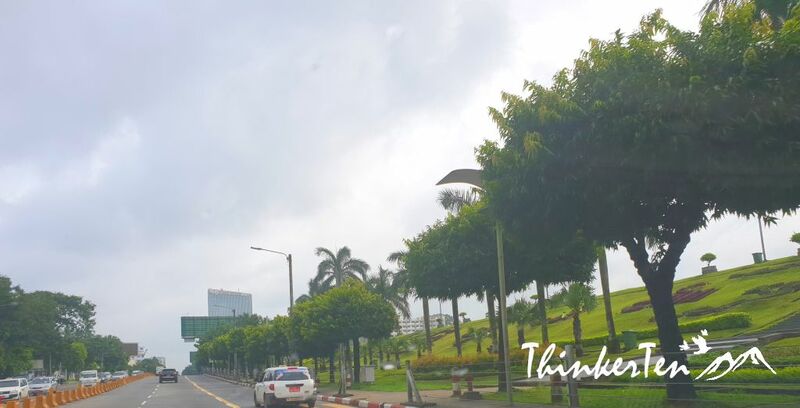 If you have more time and don’t know where to go, you may want to have a stroll in Inya Lake. 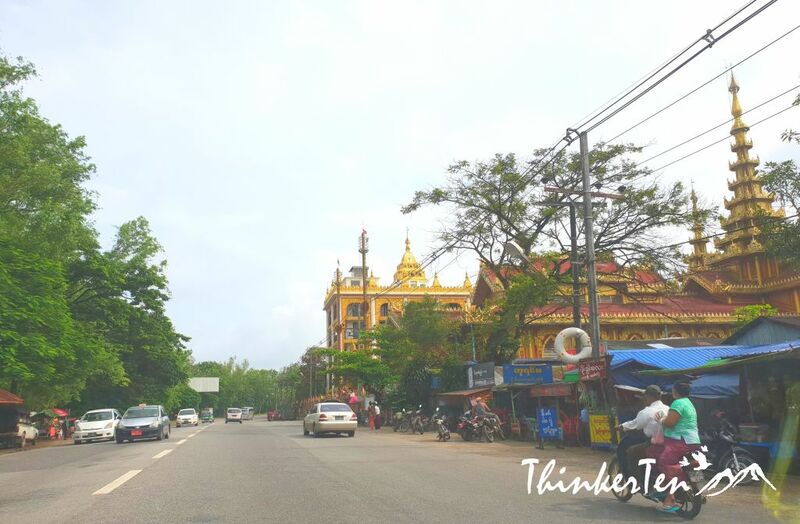 Not far from Inya lake, prabably after half an hour drive; I know we are in a small township away from the city as they are no tall buildings anymore and more motorbikes. You see people rushing out on the Saturday morning, probably to do some groceries shopping. There are yellow pedestrian crossing but look like cars aren’t stopping. It seems like locals are familiar with crossing the road without using the yellow pedestrian crossing. The walk freely and fearlessly through the road didn’t realise that they actually taking a risk every time they cross the roads. 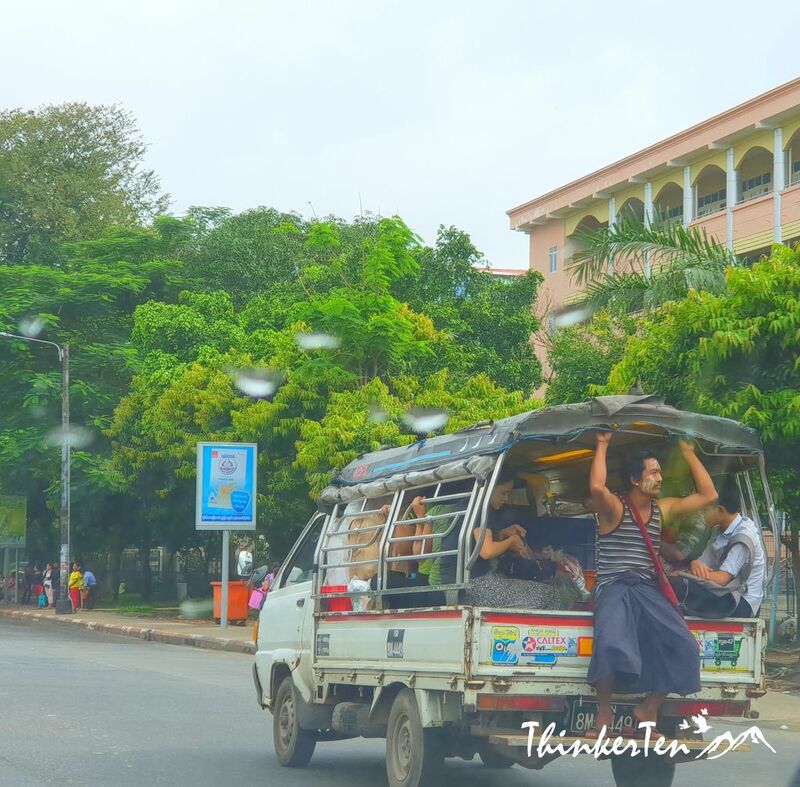 Pick up cars are often seen as a public transport in Myanmar. Sitting like so ( above pic ) can be very dangerous for that man with Thanaka painted face and I hope Myanmar government can help raise the public awareness in Road safety. 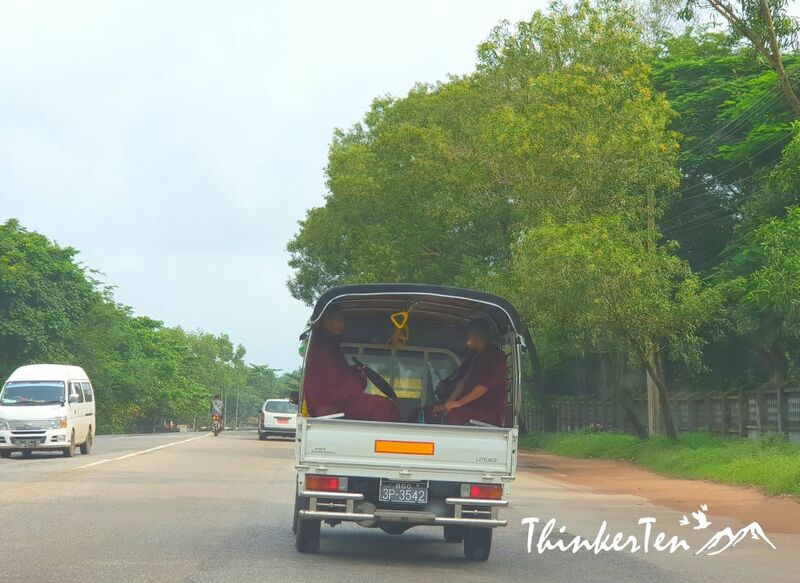 Below are monks in another pick up truck. Pick up truck seem like a very popular transport in Myanmar. Myanmar is a country full of pagodas. You see it everywhere and every corner, not just Shwedagon Pagoda and Sule Pagoda. 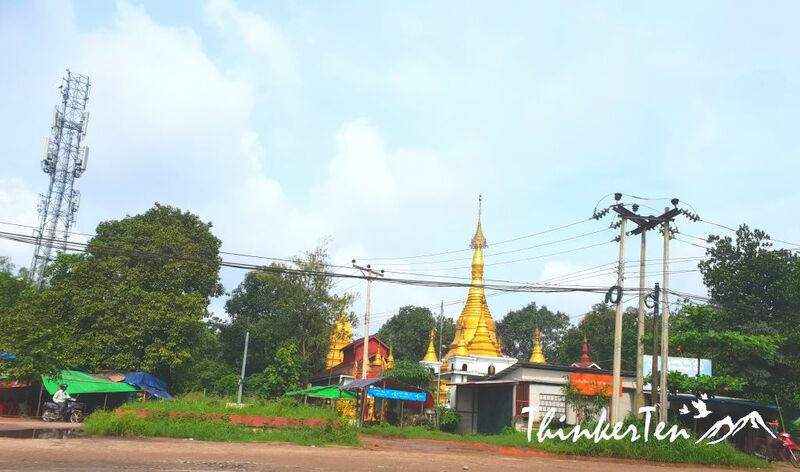 There are still thousands of pagoda in little township that are not famous. Most pagodas are in gold color but there are also in white. The word pagoda in Myanmar mean a cone-shaped structure related to Buddhism religion. 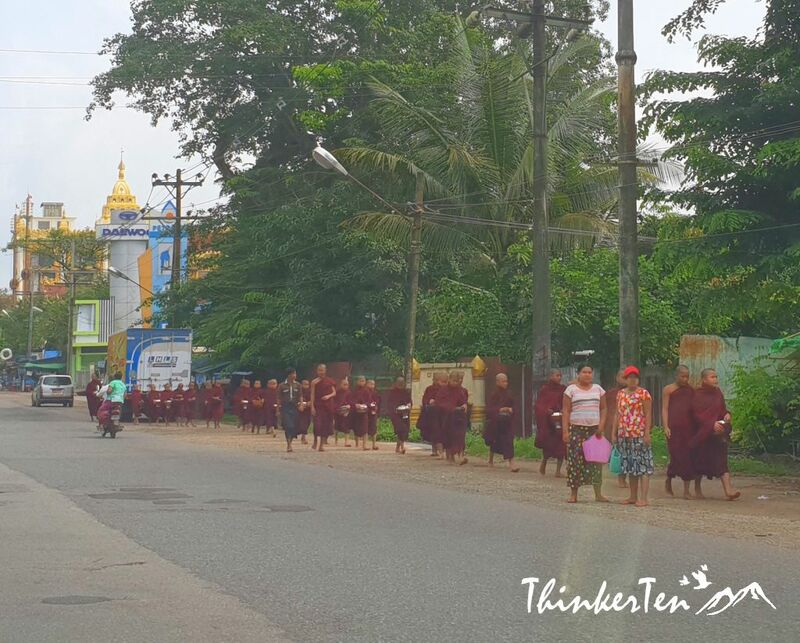 Myanmar has tons of monasteries and going to visit one later in Bago and happen to pass by one of them on the way. Monks in burgundy robes lined up walking on the streets seeking alms. ( Donation can be food or money). 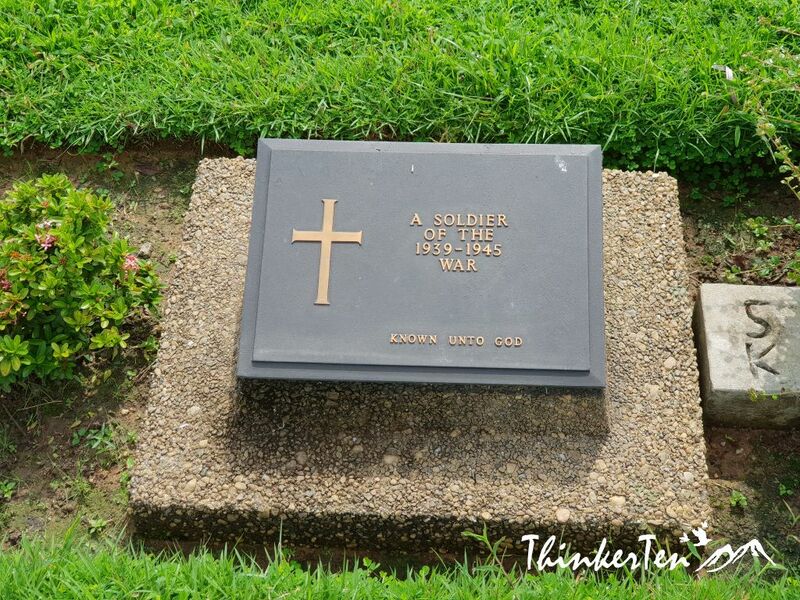 Taukkyan War Cemetery – Topic of this blog! Our driver has the first stop at Taukkyan War Cemetery. 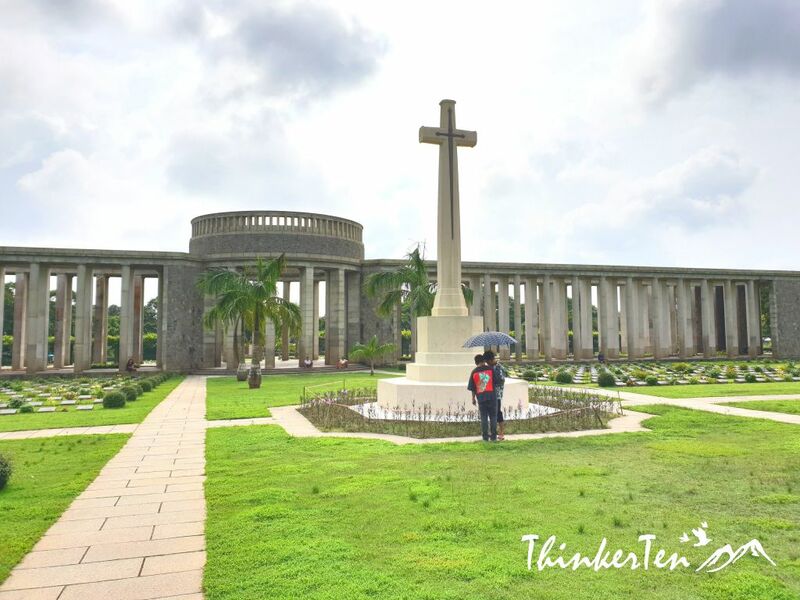 It is a cemetery for Allied soldiers from the British Commonwealth who died in battle in Myanmar during the Second World War. It is about 25 km away from Yangon. 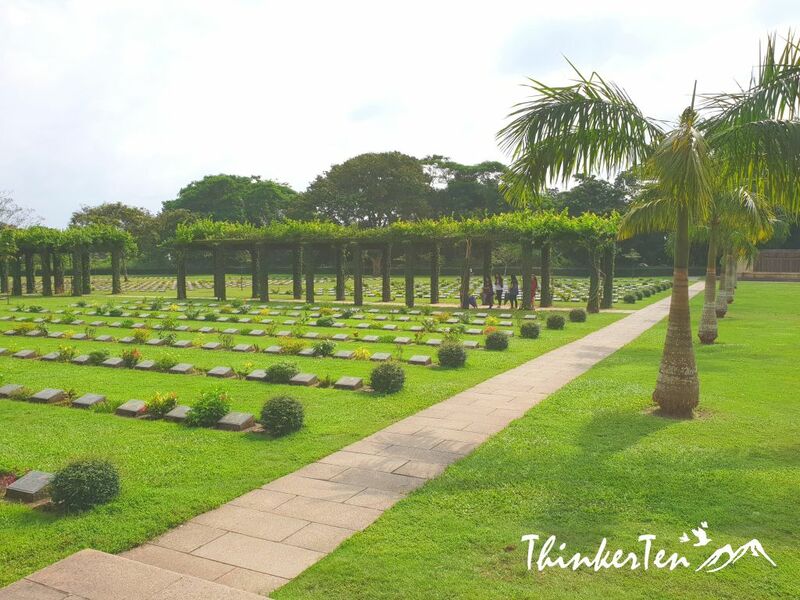 This is the largest of the three war cemeteries in Myanmar which home 6374 Commonwealth graves from Second World War (867 of which were unidentified) and 52 from First World War. 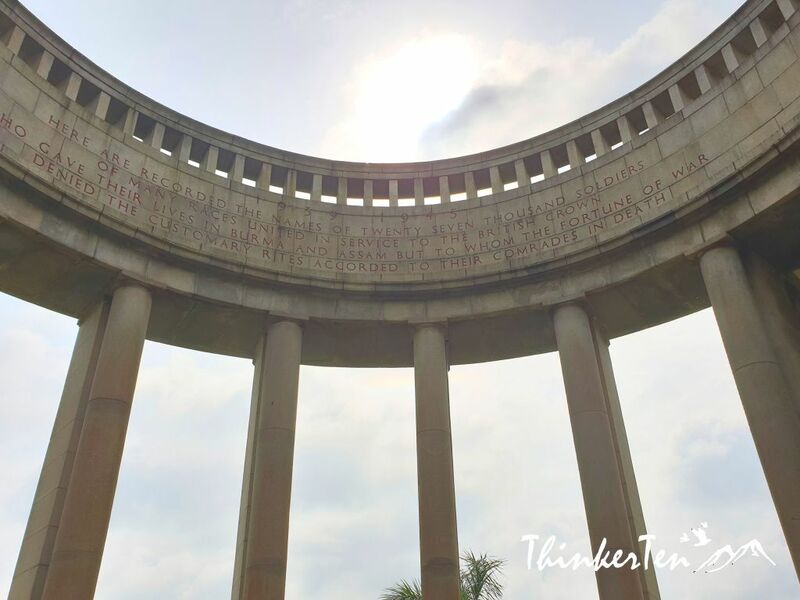 The Rangoon Memorial pillars with over 27,000 names inscribed. The war cemetery is well maintained but I was surprised many local Burmese come here for leisure. Few families have the food and drink on the grass, nice picnic area for the local I suppose since the lawn are well-trimmed. Some couples sit romantically amongst the graves and the children play happily. Not sure the dead would like the lively atmosphere? Probably some would like it as they have the locals entertaining them and won’t be too bored; dead & buried alone in the foreign land. There are in total 867 unidentified graves in Taukkyan. Sorry to learn that many soldiers from UK, Australia and other part of the commonwealth countries has fought in the Second World War, against the Japanese and sacrificed in this piece of foreign land. The saddest things was the soldiers were burried here in Taukkyan War Cemetery, which is so many thousands miles away from their home country, family, relative & friends. 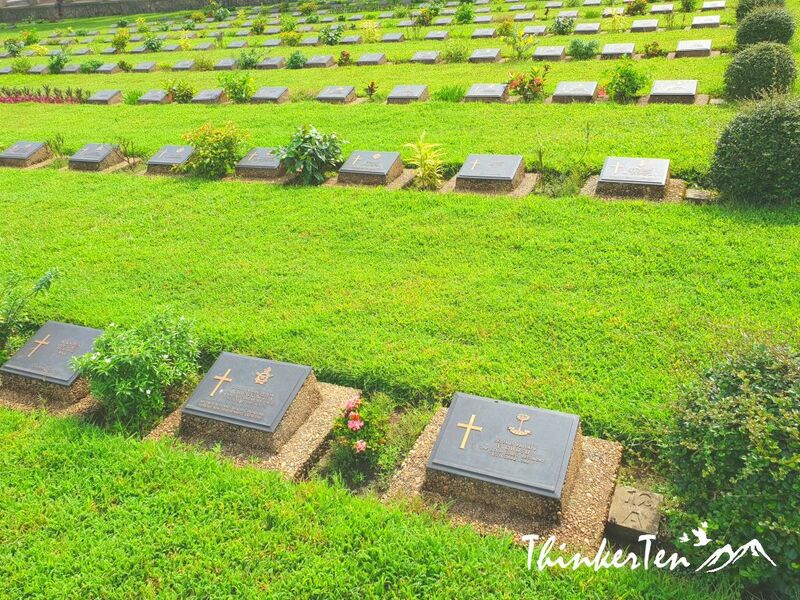 Visit Taukkyan War Cemetery only if you are doing Bago one day tour as it is on the way and about 45 mins from Yangon. What surprised me most is I saw local Burmese use it as a place for leisure and picnics. I thought cemetery should be a quiet place for the dead? 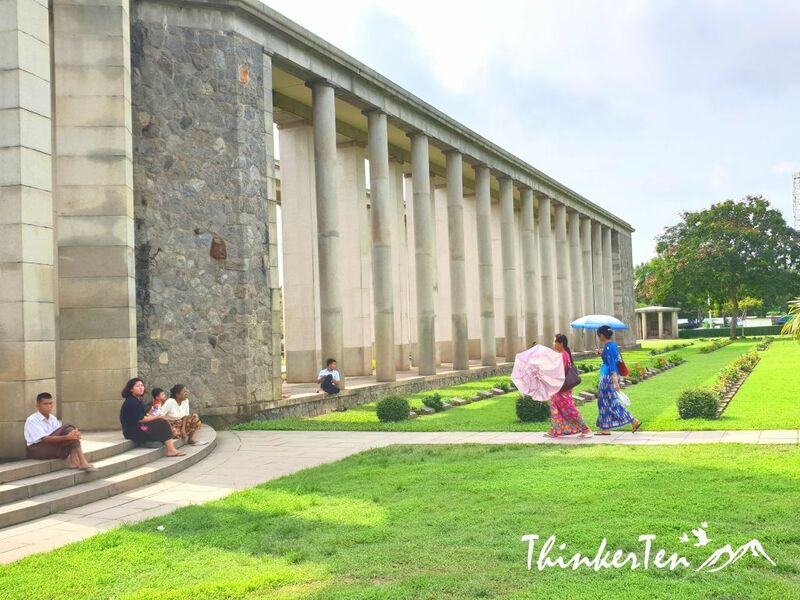 Thank you for this brif information about “Myanmar : Bago Road Trip – A Brief Stop at Taukkyan War Cemetery.” it is very important to remember our history. I bet this is such an emotional place to go and stop. But a lovely thing to do to stop by and thank all those who gave their lives for us. Well said.Thanks for your comment. I think I have seen this in one of the travel shows. It must be quite a place of history and emotional too. Yes, it is a historical war cemetery for the British who helped to fight the Second World War against the Japanese. Pretty sad to see these soldiers was killed in the foreign land and burried far away from their family members. Sorry to hear about the death of all those soldiers but frankly, that cemetery spot is not only special but also very beautiful. The cemetery is well maintained with beautiful trimmed lawn. Sorry to learn that many soldiers from UK, Australia and other part of the commonwealth countries has fought in the Second World War, against the Japanese and sacrificed in this piece of foreign land. The saddest things was the soldiers were burried here in Taukkyan War Cemetery, which is so many thousands miles away from their family, relative & friends. I had no idea that Myanmar was such a beautiful place. I would love to see it one day. Thank you for sharing it with us. love southeast asia, so rich in culture! will surely have this on my travel list! I think I saw this on teli but can’t remember where. I am scared of cemeteries though don’t know why. I too scared of cemetery and I dont think I will want to have a picnic here and making a lot of noise. Cemetery is a place for the dead and for me, I will treat it as a memorial place to rememeber the dead with respect. Interesting read. I’d love to visit someday. The picnic in the grave myard really stood out, how was that experience? What was your fave part of the trip? I was in total surprised when I saw local Burmese coming to the War Cemetery for leisure. They sit at the trimmed lawn to have picnic, chatting and eating in a group. Some are family with small children playing and stepping at the grave, young couples dating etc. My favorite part of this trip is to be able to see how the local utilize the war cemetery here! LOL. WOw. Look at all of that green. You took some great shots! Myanmar is really beautiful. And I loved how you penned down your beautiful travelling experience along with these wonderful pictures. Those transport trucks are just like the ones in Haiti. The monks walking on the streets is very unique. We see these cars a lot in Haiti (probably most of the Carribean). They pack them in tight. I am fascinated by this gorgeous country! I hope one day I get to visit! there is so much history and I love the fact that there are still many wild places to explore. Thank you for sharing this! That looks like an awesome trip. I have always wanted to visit Myanmar. Thanks for sharing this. Myanmar has such a troubled history on its own but I didn’t know that it was a fighting ground in the World War II. I think it’s nice that locals go there to have picnics, making the cemetery a happier place. Usually cemeteries are very sad. At least to keep those sacrificed soldiers company and at least they won’t feel so lonely in the far away land from their home country. This seems like such an incredible place to visit – but incredibly emotional too. It’s sad to think of those unidentified soldiers buried thousands of miles from home. You are right, those unidentified soldeirs are the most saddest thing. None of their family and relatives member will come to visit them. It is nice that they take care of the cemetery. That must have been a cool experience! Thank you for such a thoughtful post! Cemeteries are always bittersweet for me. I can only imagine having a loved one buried so far away! Visiting historical places like that are humbling learning opportunities. I also love that you went to visit a monastery. I would love to experience one in that part of the world. i don’t know if I would make it there. but thanks for providing so much information! Wow. What an interest stop. Your picture of the monks was so cool. It’s a fascinating lifestyle and the architecture. This looks like it was a cool detour/stop. I am all about art and culture, the picture of structures were awesome. What a great account of this important destination. What a beautiful place to stop and visit. Sounds like you had an amazing trip. What a neat place. I don’t travel much so I love to see pictures and hear stories from other people. Opens my eyes to how other’s live in our world. Thank you for the little history update – must have been so emotional walking through the cemetery. Seems like a fun trip. I love to travel and love looking at other’s travel pictures. I have enjoyed reading about your Myanmar travels. It was so pleasant to learn more about Myanmar peple and their customs. I also find surprising people go to the Cementery for Leisure! I have never heard of this place before but the war cemetery and graveyard are gorgeous! It’s definitely a place to check out. Nice info on Myanmar. As a tourist are there cabs or cars on hire to travel around. It looks like you had an amazing trip – so many new things to see and do, and such history to explore! What a beautiful spot to come and visit – celebrate – grieve.